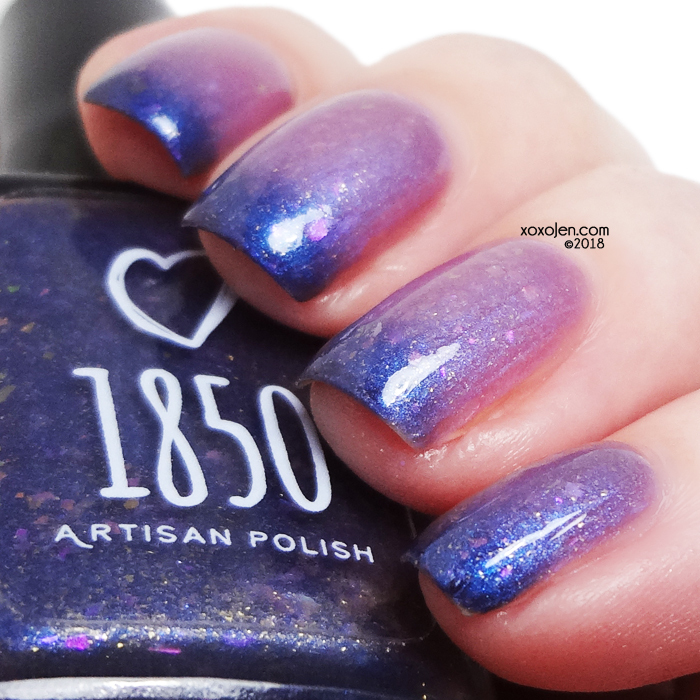 1850 Artisan Polish's second collection released to date celebrates Women's History Month and is packed with five beautiful polishes. For each of these polishes, I wore two coats with her Fast Track topcoat, which is fantastic! The formula was great for all five polishes. They do have the plastic/crayon-like odor that some indie polishes have, use caution if that bothers you. 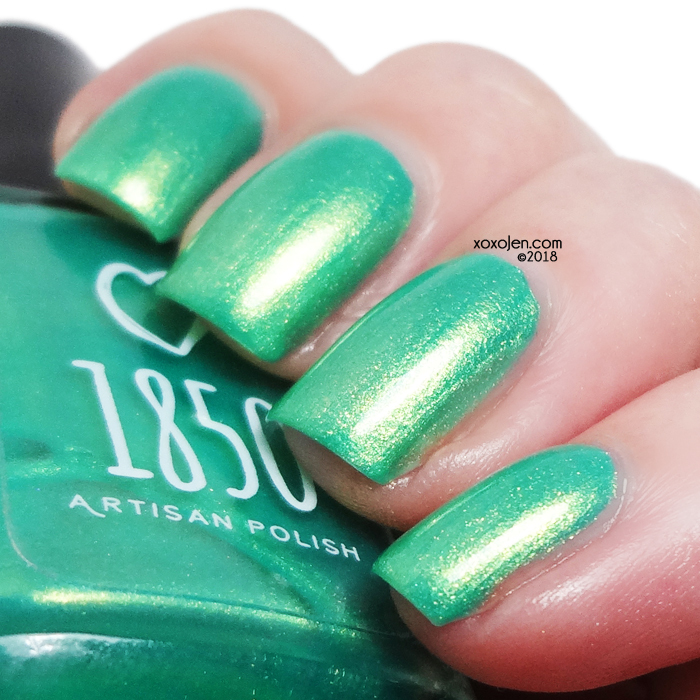 a delicate spring green that shifts to a bright gold and is packed with gold shimmer. This fresh color is inspired by the life of Biddy Mason. Mason was a former slave who, after being brought by her owner to California, petitioned the court and was granted proof of her freedom. She became a nurse midwife and with her earnings was able to purchase land in Los Angeles, making her one of the first African American landowners in California. She was a philanthropist who generously shared her wealth with others, especially the poor and the imprisoned. The green chosen is a symbol of Mason’s new life, the new life of the babies born in her care as a nurse, and the green trees growing in the park named for her. 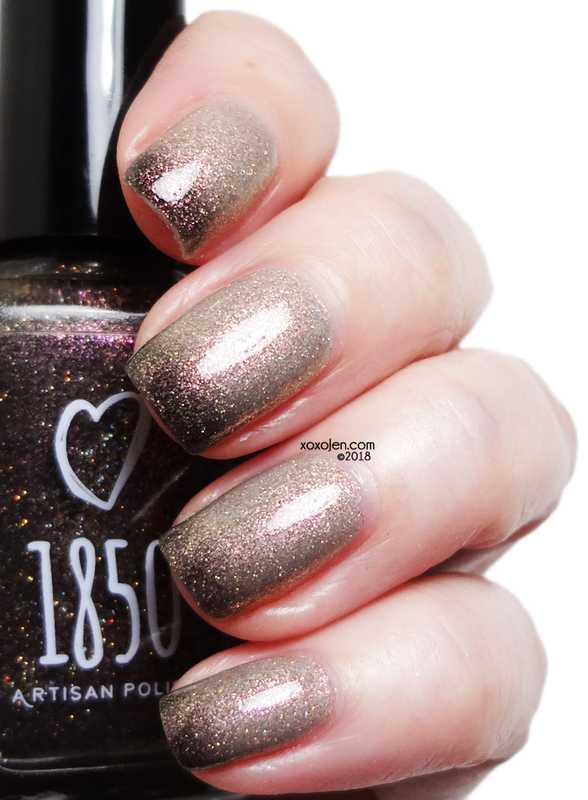 an earthy toned polish that starts with a smokey gray base, has a multidimensional copper/pink/plum shifting shimmer, and is finished with a beautiful gold sparkling shimmer. This color is inspired by Helen Hunt Jackson, an author and activist who used a novel to describe the mistreatment of Native Americans living on Mission land in California. She helped create change through affecting public opinion with her descriptions of the land and its people. Her desire was to write a story which would move the hearts of readers, and she successfully published Ramona in 1884. Her legacy reminds us all to use our voices against injustice. 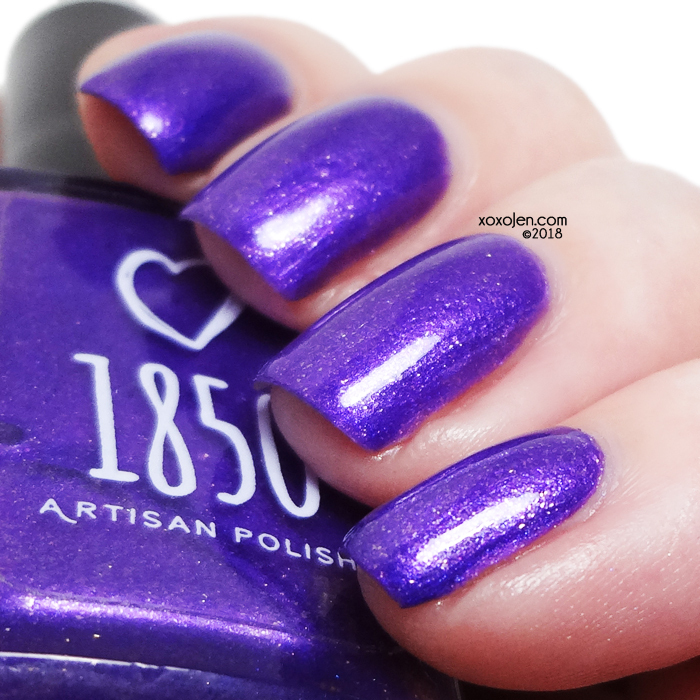 1850 Artisan's version of Ultra Violet, the Pantone color of the year for 2018. 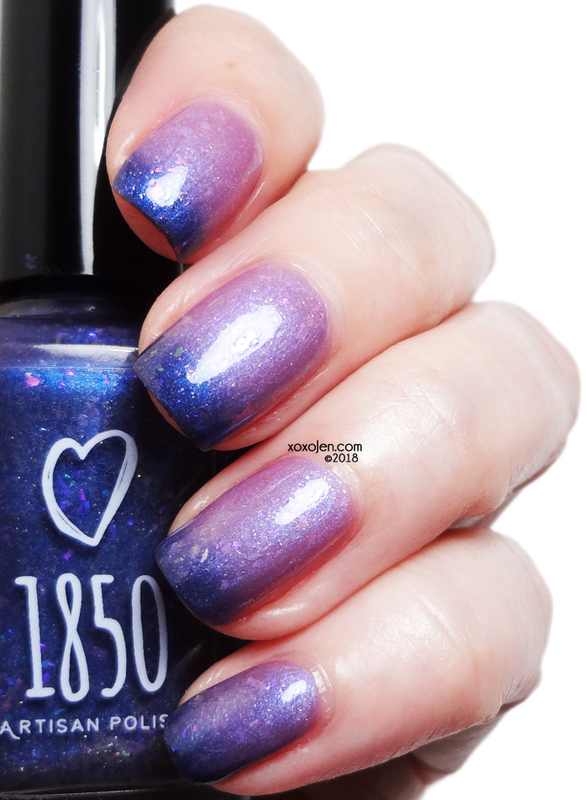 This clear ultra violet polish is shimmering on its own, but is also packed with gold shimmer, giving it a glowing sparkle. a thermal that transitions from a sheer pink with a blue flash when warm to a midnight blue when cold. It has gold shimmer and subtle, opalescent color shifting flakies that shift between violet, turquoise, blue, green, and gold. 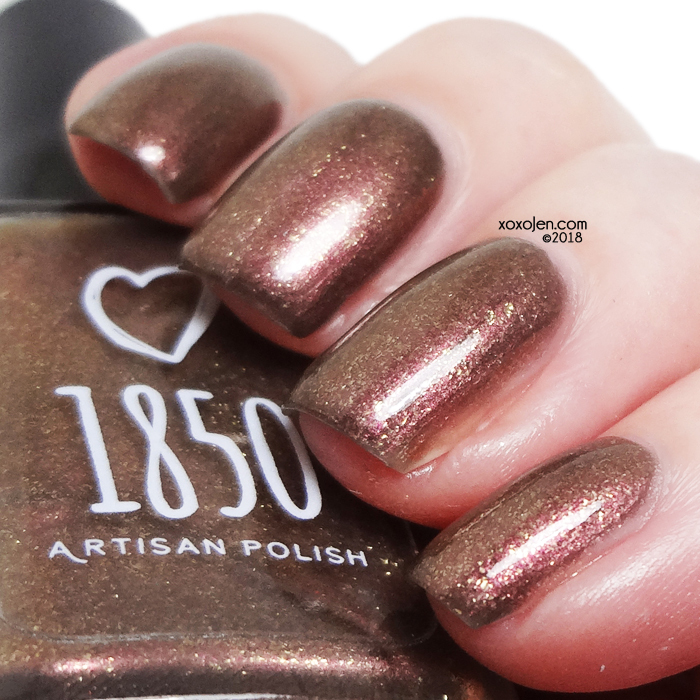 This polish is a celebration of the unlimited strength and power of the women who change the world. a multichrome thermal with scattered gold holo micro glitter. It transitions from a champagne pearl with fuchsia/red shimmer when warm to a blackened base with a fuchsia/red to gold multichrome sparkle when cold. This polish is dedicated to all of the women who have been groundbreakers as they forged new paths, pushed conventional boundaries, and created a better world for everyone. 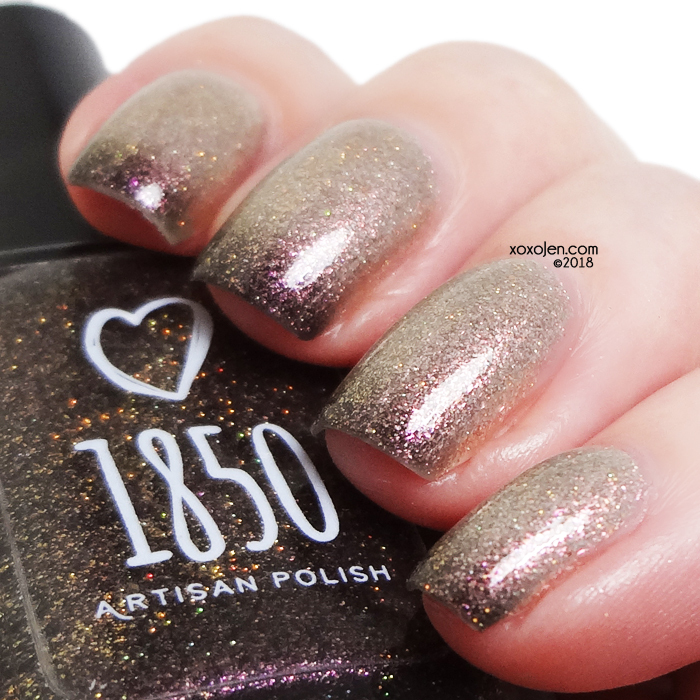 I enjoyed learning about the inspirations behind each polish, and hope that you have too. Working with Nikki to review this collection has allowed me to catch a glimpse of who she is. I've found her to be genuine and compassionate. Not only in how she communicates with me, but also the creation of this collection and the inspiration behind each polish. 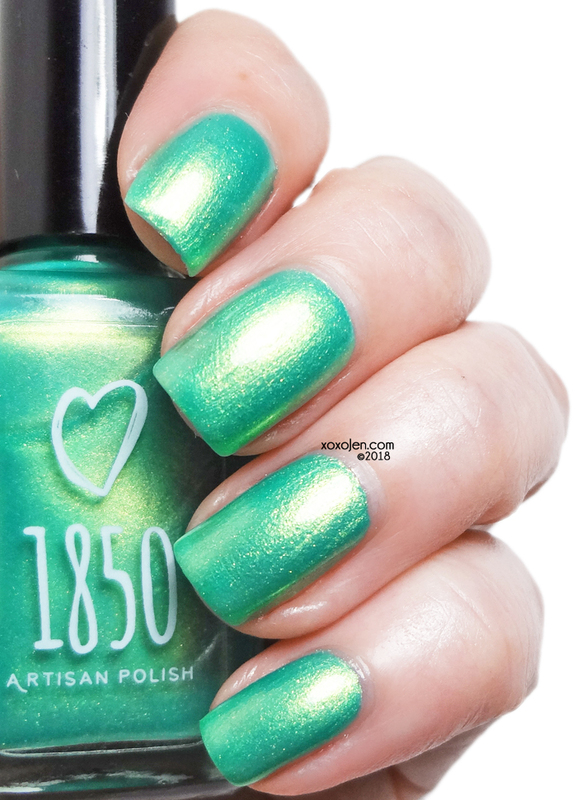 All five are polishes available now at https://www.1850artisanpolish.com/.